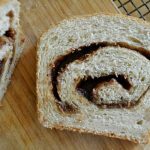 A fresh new idea for using old grotty bananas, Yeasted Banana Cinnamon Swirl Bread, a moist yeast bread with a perfect cinnamon swirl in there too. Great for snacking, toasting and for using up old(er) bananas. 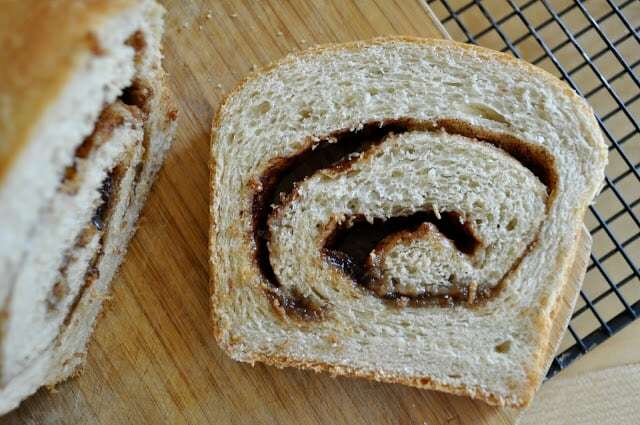 Even your NON-banana eating people will like this bread. Oh yeah, I have those kids, if one likes something the other naturally despises it, you know those kids, or maybe you were those kids? One loves eggs the other is “meh”, one loves steak the other is “no thanks”, one loves DOING, the other is content with reading all day. I have one who loves bananas and the other is adamantly opposed to them but I keep buying them. I keep buying them because they’re so dang handy to throw in the car for a quick power-up snack and they come in their OWN container no baggie needed. Then, of course, it always comes down to the last 2-3 bananas quietly melting into a brown goo in the pantry. I toss them in the freezer for baking at a later date and to be truthful that later date often finds me with 10-15 bananas in the freezer. So I’ve made a pledge to stop tossing them in the freezer and to start using them immediately, and in more things besides Chocolate Chip Banana Bread with Streusel, One Bowl Chocolate Chip Banana bread, muffins, and Monkey Bars. I found this amazing and pretty much perfect recipe for Banana Cinnamon Bread by Donna Curie over on Serious Eats. Right out of the gate I found a perfect recipe. Moist yeast bread with a hint of banana and a lovely simple cinnamon swirl. The only thing I changed was using butter to grease my pan, I don’t use spray because I don’t like the overspray everywhere. And I use sour cream instead of yogurt, you can use yogurt thought. One tip from me though, do not let this cool in the pan, the bottom will get soggy. I had to leave to gather kids from school as soon as it came out of the oven when I got back 45 minutes later the bottom was soggy. 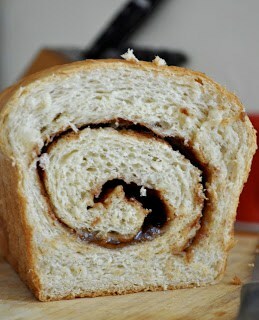 A fresh new idea for using old bananas, Yeasted Banana Cinnamon Swirl Bread, a moist yeast bread. Great for snacking and using up old(er) bananas. Make some! All for the Cinnamon Swirl Banana Bread! And the one who doesn’t like bananas ate two slices for a snack before heading out to kayak in the rain puddle in the woods, he didn’t even mention that it tasted like bananas. And of course he tipped over his brother, the one who DOES like bananas and also ate two slices for a snack, in the kayak in the puddle in the woods, because that’s what brothers do. And no for the third year in a row we don’t have snow in Alaska, it’s rather disappointing. Pinned! Cannot wait to try this one! Sounds good and I think one can cut back on some of the sugar by using another banana instead. Would that work or should I just reduce one of the sugars? I’m not sure? Try one method and let me know! hi! I don’t have a stand mixer, would it work with a normal hand mixer and my hands? YES! It will require more work but there is no reason it would not work! PRETTY sure this is on tomorrows schedule. It looks delicious! Oh I hope you made it! !